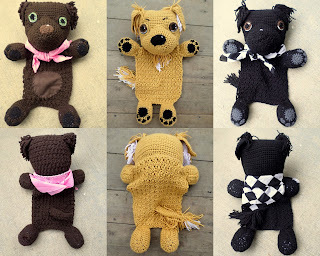 These are the 20th, 21st, and 22nd dog breeds available as a Blankie!!! Handy index to find the parts you need for the dog you want to make first! Pattern is written with ease of reading and keeping your place in mind. Golden only: An additional 20yds of #2 weight (baby yarn) in white or cream for feathering. Alternatively, you can use #4 weight and comb or split the fringe after attached. Ldc – long double crochet – Yarn over and insert hook into the stitch 1 row below and complete dc as usual. PUFF – Puff Stitch – (YO, insert hook, pull up a loop) 4 times in the same stitch. YO and pull through all 9 stitches on your hook.